Note from Rohan & Ian. We had a big, exciting announcement planned for yesterday. However, as many of you will have heard, a horrendous act of terrorism rocked our little country of New Zealand a short time ago. As a nation we’re in a state of shock and have been taking time to mourn. Our hearts go out to the victims, their families and their community. Hate and intolerance have no place in the world, and we feel more resolved than ever to stand for diversity and acceptance of all cultures, races, genders, sexual orientations, and religions. We hope our users and friends worldwide feel the same way and will be kind to their neighbours too, whoever they are. As our planned announcement relates directly to Deluges we’ve already shipped to users in the past couple of days, which are quickly working their way through the international courier network, we’re going ahead and announcing our news, which would be out very shortly in any case. However, the rest of our announcement will take a slightly more sombre tone than usual, as reflection and coming to terms with what’s happened become our focus for a time. This major software update will be out later this year. Development is still underway and there will be a lot more to unveil soon, but the feature we can finally demo to you is is our new QWERTY keyboard mode. In this mode, the Deluge's pads double as a QWERTY keyboard, allowing you to type text. This is accompanied by the ability to give your saved songs and presets actual text-based names, and quickly locate files by typing their name or first few characters. This will be a serious workflow boost for our users who have hundreds or even thousands of songs saved, or work with large libraries of samples. See the video below for a demonstration. We’ll be unveiling the V3.0 software at Superbooth in Berlin on May 9th, but will share another tease and further details on what you can expect before then - subscribe to our YouTube channel: https://www.youtube.com/c/SynthstromAudible to see first. To make the QWERTY keyboard feature complete, we've made some small changes to the look of our Deluge's top panel - principally that the QWERTY keyboard letters are now printed in blue next to each pad. And although V3.0 is still months away from being released, we've rolled this change out this past week in order to give the maximum number of customers the latest hardware ahead of time. If we've shipped your Deluge in the last few days, you've already got this new panel. Beyond the QWERTY keyboard lettering, our updated Deluge panels have a few other changes to the labels printed on them - some relating to features already implemented, and others to features we'll be implementing in the future. A few new labels have been added to the small round buttons to describe additional functions (some of them shift-functions) which have been added to these buttons via firmware updates since our initial release. The BACK button now indicates its UNDO and REDO functions; the RECORD button now indicates its RESAMPLE shift-function; the LEARN button has the word INPUT added to it, for an upcoming function to be explained closer to the release of V3.0. You'll also notice that the TRACK button has been renamed to CLIP. We are taking the big step of renaming "tracks" to "clips" in our Deluge documentation. Since the introduction of the arranger in V2.0 almost a year ago, the word "track" has seemed like an imperfect descriptor for a sequence of notes which can then have instances placed along a higher-level arrangement timeline, which users might also visualize as a "track". "Clip" is a word familiar to users of other DAWs and hardware, meaning a low-level item which may be created, launched, or placed along a broader timeline. This change in terminology has zero effect on the way the Deluge is operated by the user. 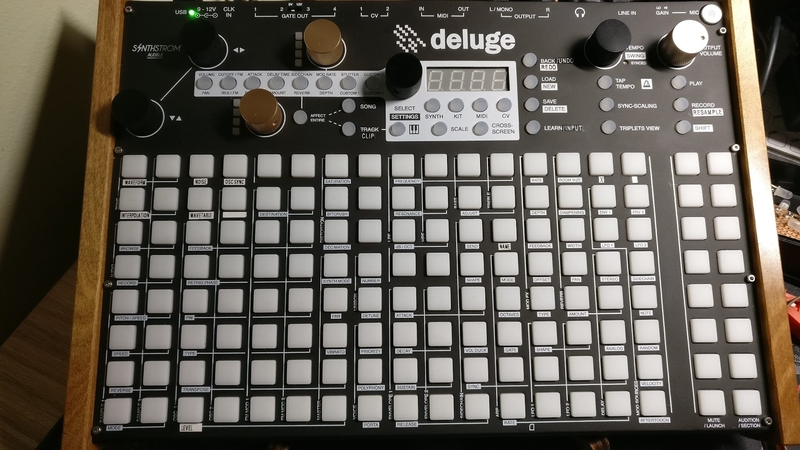 The Deluge "shortcut" labels, too, among its main square pads, have had some minor changes made - some for features which we've already added in recent firmware versions, and some for features we will be adding in the future. Don’t panic if you don’t see any reference to a feature you’ve been hoping for among the new shortcuts - remember that we’ve released five significant software updates with many new features without any need for a change to our last shortcut matrix. The few changes to the new shortcut matrix are very simple and easy to remember if you wish to use the new layout with your old shortcut matrix. If you would however like to have the new shortcut matrix handy you can buy (LINKED) a magnetic overlay from us with the new diagram. The new 3.0 shortcuts (including QWERTY) magnetic overlay can be pre-ordered for $20USD + $3USD shipping. We are aiming to offer this in multiple variants, AZERTY, QWERTZ, etc. You will be able to choose your overlay before we ship. You may choose to purchase a replacement top panel instead and replace yourself for $50USD + $18US shipping. Keep an eye on newsletters/announcements for further details on that option. The 3.0 update will not be publicly released for a few months yet - though we won’t ship overlay pre-orders straight away, you will receive yours before the 3.0 release. If you’d like to donate to the many families who lost loved ones in this act of terror, please consider making a contribution. That's great news! Thanks for improving this already fantastic machine. Our thoughts are with your country in these times. "Clip" is a word familiar to users of other DAWs and hardware, meaning a low-level item which may be created, launched, or placed along a broader timeline. This change in terminology has zero effect on the way the Deluge is operated by the user. So still no matrix clip view planned, even though it's one of the most requested features (Akai is delivering this right now btw) while almost nobody asked for wavetables for the Deluge? Racism and hate are the worse blight on the face of this earth. Thinking of you all over there. I can't imagine how this must feel - New Zealand seems like a big village so this must be especially brutal. Peace. Cool update! 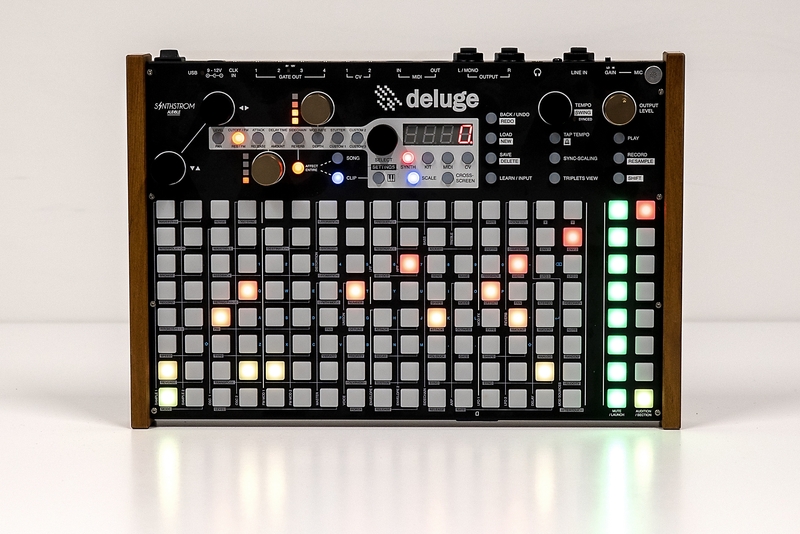 Wavetable synthesis should really add the Deluge. 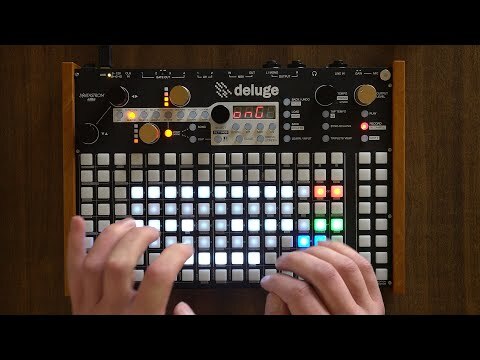 I know this isn't the suggestions page but it would he really cool in the future if while using a kit you could press the keyboard button and it would turn the pads into an MPC 4x4 layout for finger drumming. The vertical playing is alright but seeing as right now the keyboard button doesn't do anything in Kits this could be really cool way to make finger drumming work better. Keep up the good work with these updates! And my deepest condolences for the tragedy that happened yesterday. How thick are the magnetic overlays? Are they flush, or nearly flush, with the buttons? EDIT: Also, will replacing the overlay remove the warranty for anything that might go wrong, or only things that are a direct result of improper installation? I took the cheapo option and got out my label maker - you can't even tell the labels weren't there originally! Looking forward to this update! That's an amazing pace for advancing this instrument! I hope we can also (re-)name samples using the new QWERTY feature. Only songs and patches were mentioned in the teaser. This is really exciting. Every time there's a new big update, I get a sense of how big the vision is for the Deluge, and I realize that even though it feels like a finished product to me, it's not nearly complete! I'm so glad I made this machine my main instrument. With wavetable synthesis we'll have Serum in a box! We plan for there to be options for the overlay, but not for the printing on the panel itself. Wow - very cool update! PS - tragic news from NZ, thoughts with everyone over there, keep on rocking in the free world. On the far left there is a shortcut for Speed AND one for Pitch/Speed. I think this should be Pitch/Time, like it originally was? Edit: hmm it seems this was already there with 2.0, according to the pic posted by Tenebrous? Not at home atm, so can't check for mine, but I found an old image of 1.0 which said Pitch/Time instead of Pitch/Speed. Great addition! So if I still want the file to start with a number I can type: 036Eagle and it will come up after 35? The recent news was so tragic, we are sending our good thoughts to New Zealand! Yes, we changed a fair while ago, functions the same, but we felt Pitch/Speed would make more sense within the rest of the terminology. I'm excited about the prospect of more additions to the Deluge - wavetable is going to be amazing. I'm stuck with the dilemma of chooising overlay over the replacement panel though. I'd like to buy the panel but I am concerned there might be other significant changes to the Shortcut layout - is this likely? and my second question is will you have enough panels to cover orders that arrive AFTER version 3 is released? Hey guys, thanks so much for focusing on existing users as well as expanding options to capture new ones. This update feels like a good balance of addressing existing workflow but also adding new features to further appeal to new customers. I've been eyeballing a Micromonsta for a while but hopefully 3.0 will scratch my wavetable itch. Quick question for @rohan &/or @Ian_Jorgensen ... I know you literally said that the terminology change from "track" to "clip" will have zero effect on how we use the box but does that mean there won't be any changes to "song" view? Having logged more time with Arranger mode, Song mode/view seems almost obsolete at this point once you start creating tracks from Arranger mode as song mode turns into seemingly endless scrolling. Will there be a new "Clip" view in the future (where you can see all of an "instrument"s clips in one row), perhaps in addition to Song view? That is correct. It is simply a change in vernacular so that it makes more sense within the architecture of the Deluge, primarily because of the Arranger. I don't think we're near the end of development yet, so I would assume that there would probably be another update to shortcuts in the future...we won't be rushing to this though, and potentially the next update could be very minor - like potentially just adding some things to some empty slots - which people may be able to commit to memory- the addition of QWERTY was obviously pretty huge in regards to the shortcut grid, so really does warrant a new panel or overlay to get maximum effect. It's hard to say, we can't really speculate on how popular things might get, I'm anticipating yes, though, yeah, 3.0 has some pretty special stuff in it...sales could rocket. I thought it was a hint to the highly requested clip launch view coming soon (like Ableton's session view)? Hi Ian. Regarding panel overlays would you consider offering a pdf or a file which could be purchased from you for producing our own templates?